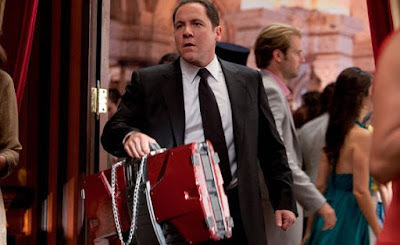 You have Jon Favreau to thank for a lot of Marvel's early success. Not only was he the director of the first two Iron Man movies, but he pulled double duty by playing Tony Stark and Pepper Potts' bodyguard, Happy Hogan. The character was last seen in Iron Man 3 , but he'll be making his first non-Iron Man appearance in next year's Spider-Man: Homecoming. The news was confirmed by Variety, who don't have much else to add. Favreau will be reunited with Robert Downey Jr. who will be bringing Iron Man to the film, as well. Favreau and Downey recently co-starred together in Chef, which the former directed. If anything this further cements Tom Holland's Spider-Man into the MCU, which is pretty cool. I fully expect Hogan will be the victim of Spidey's webshooters at some point because at this point he's basically just comic relief. Even as he was getting burned to a crisp by the Mandarin's forces it was still kinda funny.